To my lasting regret, my formal musical education (piano lessons) ended when I was about 12 years old. When I was a student in Rome I did learn three chords on the guitar fairly quickly and can still strum out about half a dozen. The purpose of learning to twang a guitar was to offer some useful input to the class of five year olds that I taught while in Rome. Half of them spoke Italian and half spoke English so singing to them was an important weapon in my pedagogical armoury. Thanks to negotiating that derisory learning curve, I can play just about anything in the "20th Century Folk Hymnal" or "Songs in the Spirit", books which formed part of my liturgical music experience while at the seminary in the 70s and early 80s. There was a time when I played the piano or organ with much the same technique, (using a book with the melody and the guitar chords in it) in the absence of anyone who could do so with a modicum of competence. My "like riding a bicycle" guitar skill gets dusted off once a year for the informal part of the parish music evening once all the precociously virtuoso children have dazzled us with just learned for Grade 6, and the adults have had a beer or two. This background will help you to understand something of the fear and trembling that seizes me in the presence of great musicians such as James MacMillan when musical matters are raised. 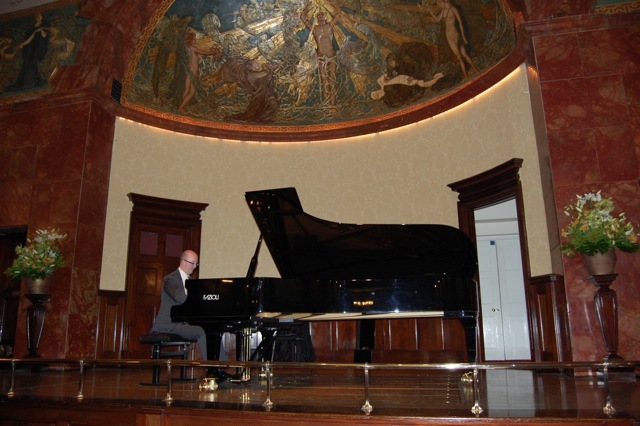 Another outstanding musician I have had the joy of getting to know recently is Matthew Schellhorn, described as a "rising star" by Radio 3 and "one of Britain’s most exciting young pianists" by Classic FM. The importance of the theological underpinning of Messiaen's work has been patiently explained to me by my brother-in-law who plays in the Grainger String Quartet but I still have much to learn. My education has been helped by Matthew Schellhorn's recording of Olivier Messiaen's Chamber Works which has had widespread critical acclaim; Gramophone magazine described it as a "worthwhile and distinctive release."